Hey there. I found these charts over the weekend and had to stick them up. I believe one of these pages made it to the sketchbook but not all three, so here you are. I also found the Pantone color chart used in painting the Enterprise E for the First Contact physical miniature. I’ll post that one on “E” day. Enjoy. Here you go Bernd!!!! Note that in the first scale chart The “E” is still a Galaxy class starship. The one with the borg cube was in the Book. Thanks for posting these up. I knew one of them was!!! No, there were no scale charts with the Borg cube in the Sketchbook. I always liked that you guys went to the trouble of doing scale charts. Nifty. Why do these charts get made btw, is it for the production guys and writers so they can get a better grasp of it all? Or is it shearly for reference? What happened to the 3rd chart? It was there one moment and now it’s gone? Third chart? What was on it? is it still gone or has it come back!!! Still gone, I think Dea inadvertently deleted it. I’ll go in and put it back. awesome, I still can’t get the email notification’s to work,,, called word press and they can’t figure it out either,,, what a mystery,,,, welcome back by the way!! If I inadvertently did that, I apologize, but I didn’t think I even scrolled down that far. Thanks for posting the charts, John! I second that; the size comparison of Alex Jaeger’s ships is priceless, since we’ve only had the Encyclopedia so far as true reference; some of the ships were scaled down considerably for DS9 (e.g. the Akira at 840-860 feet), making those figures unreliable. 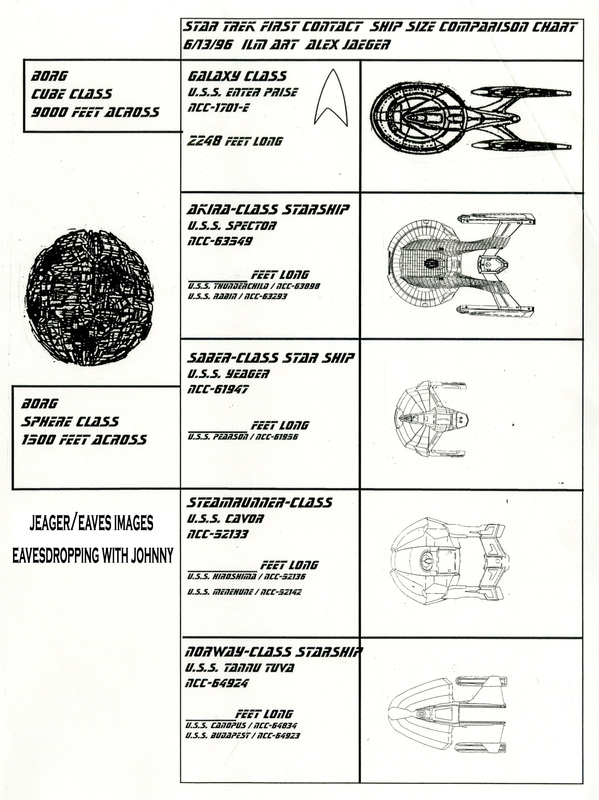 And the starship comparison chart in the DS9 Tech Manual is pretty unreliable also. (though I’d pretty much figured that out long ago, no offense to Herman Zimmerman, Rick Sternbach and Doug Drexler) It has both the Saber and Norway classes at 364.77 meters. However, the Saber is clearly a lot shorter than the Norway. I haven’t done my scale thing yet, but that could be right for the Norway because, just by guesstimation, the Saber looks like it’s, at most, 200 meters long. And the DS9 Tech Manual also lists the Akira as being 100 meters longer than the Saber and Norway, but it doesn’t look like there’s that much a difference between the Akira and Norway and there’s considerably more between the Akira and Saber. The story from Larry Nemecek is that several numbers and names were pre-approved by the Star Trek Art Department (at least for the Akira, but probably for the other ships as well), so that the CG modellers could just drop them in as necessary. I’m wondering if these other names and numbers were actually used onscreen, except that we wouldn’t have seen them up-close. Now I see all the charts. None of them were in the Sketchbook, but a color version of the one with the cube was published in the article “Designing Borg Ships”, from the March 2001 issue of Star Trek: The Magazine. However, the size of these is excellent since now I can actually see that the sphere was supposed to be 1300 feet across, not 1500 as we thought (even though it’s 1500 in Alex Jaeger’s chart). that is supposed to be 1500 feet I’ll go in and correct that picture!!!! No, don’t! 🙂 I like my primary source information as-is. It’s better if you add a note in the caption (but then again, it’s your blog — I saved the originals anyway). But then looking at the first ship always gives pause and brings memories of Kirk’s voice has she sails by the camera (or the camera sails by her, actually! 🙂 ). Just amazing seeing the evolution over the years from the original 1701 to the 1701-E. Just love how sleek she is. almost to sleek in comparison,,, that little sketch is the version of the E with the double vents on the saucer,,, the purpose was that it had a mini warp system in side for light speed when separated from the main body! John: you mentioned in the Sketchbook that you worked up some kind of primer/short guide on the Enterprise-E, similar to one you saw in Rick Sternbach’s Voyager files. If you still have it, it would be great if you could scan it for a future blog entry, since there is a lot of information on the Ent-E out there, but we don’t know what was actually established in the Art Department, as opposed to invented later by licensed sources. I am sorry,, what did you want to see??? “On top of it all, [Rick Sternbach had] made a little booklet that included the breakdown: all the decks, what [Voyager] could do, how it did what it did. He even had a scale chart comparing the Voyager’s size to the sizes of the other Federation starships. Thanks to Rick’s help, I made myself a similar packet for the Enterprise-E”. Maybe I’m wrong and you meant something else by “packet”, perhaps simply a collection of concept sketches, but I’m curious. Woo! USS Pearson! Almost my last name. 🙂 Nice to see all the other new ship names, too. We only got a few names of those fleet ships in the Encyclopedia and over the comm channels in the movie. The Spector ended up in Voyager, though (possibly with a different spelling? ), where it was the ship flanked by Defiants that helped fend off the Romulans in “Message in a Bottle”. Pearson?!? As in Lester B. Pearson? Never mind. Found it, thanks much! There are no measurements on the first chart for the Akira, Saber, Steamrunner and Norway classes. Did you forget to fill in the info? Also the Enterprise is listed as a Galaxy-class which you did indicate in your original post, but you give it E-E’s registry # and have a drawing of the E-E in the chart. So is that scale for the E-D or E-E? originally the E was to be only a decal on the Enterprise D model to save the cost of building a whole new ship for STFC this sheet probably reflects that idea in the brief heading where the New E is pasted on the chart! Alex Jeager made this chart when setting the scales so you’ll have to put a scale to them using the E as your standard to get the figures,, I believe someone is already doing it so I would stay tuned for when they post it back. Re: USS Tannu Tuva. Is someone a stamp collector? Hey John, I’ve heard this question before, and who knows, it might have been answered somewhere already, but…. on one of the DVDs they show the Ent-D in storage with the E instead of the D. Like you mentioned, it might have been used in FC instead of a new ship, but why/how did it get to the point of changing the decal on the model? Was there so little time between the decision to go with a new model that they had already started to prep the old model? Were they at one point definitely going to use the old model and then suddenly changed their minds? Or was it always up in the air until they decided to make a new ship? I haven’t seen that particular question answered, and it’s a good one. I just think the photos John took at the auction house are surreal! Seeing that E is quite the shocker, huh? It just looks all wrong!! I can’t imagine how surprised he was when he saw that. in most cases the people you are presenting things too don’t have a perception of what your explainging verbally so you need to back up your arguments with a visual!!! I am sure that this is the case,,, they had the ILM guys put an E sticker on it and then they had an early meeting at the warehouse, and then decided what to do on the spot!!! 1) The Akira saucer seems to be as long as the Sovereign saucer is wide. 2) The Sabre appears to be as long as the Sovereign saucer is wide. 3) The Steamrunner saucer is almost as long as the Sovereign saucer is wide. 4) Likewise, the Norway saucer is almost the same width as the Sovereign’s. If one starts using a nice metric figure of 250m for one aspect of the ship such as saucer width, other proportions are likely to start matching it, so the Akira ends up being twice that, hence the numbers. However, this is only a hypothesis at the moment, unless Alex Jaeger remembers how he did it. Awesome! This is a fantastic reference! What is the sketchbook that everyone keeps referencing? This is the one I believe they are referencing, although I haven’t got one myself. Great minds think alike, Boris!! Finally something definite to get the ship sizes right. Thanks for posting John! I will see how the new figures compare with my old estimations. Can we say Canon?? The E never seemed that large in the movies. I mean, I knew it was big, but never thought it was longer than the D…guess the skinniness of the E is deceiving. Good stuff though…filing it away for future reference. Remember that, besides everything else, the E-E’s nacelles stick waaay out from the back of the secondary hull, whereas the E-D’s don’t. If you only look at the saucer+stardrive length, the E-E is shorter. What is the name of the last Steamrunner class ship? those names are the Cavor, the Hiroshima, and the Merenure. Hi John, is that Merenure or Menehune? (which Google says is a mythical Hawaiian dwarf – I didn’t know that…). Just checking as the chart spells the latter when you zoom in. BTW, do you recall why you chose 9000 feet for the cube and 1500 feet for the sphere? I always like to know the rationale behind design decisions. we would make a bunch of paper cut outs at different percentages and lay our little enterprise cut out along side to see how it looked. Once we saw what looked to be an appropriate size we would throw a measurement on everything based on the “E’s” length as the standard. Thanks for measuring the lengths btw, Boris, they seem larger than the ‘official’ figures that have been quoted before, but I wondered whether that would throw the scales out? – I believe the Steamrunner and Akira have the same escape pods as the Sovereign for example, which I think Bernd used for his comparisons, is that likely to muddy the waters further size-wise? The escape pods were definitely intended to be the same as the Sovereign’s according to Jaeger and their scale seems to match according to Bernd’s measurements, so I don’t see a reason not to have them match perfectly in the final analysis, even if the figures end up being slightly inconsistent with this chart. However, we must also consider that if we use 2248′ for the Enterprise-E, the schematic used with that figure could affect the escape pod measurements slightly. 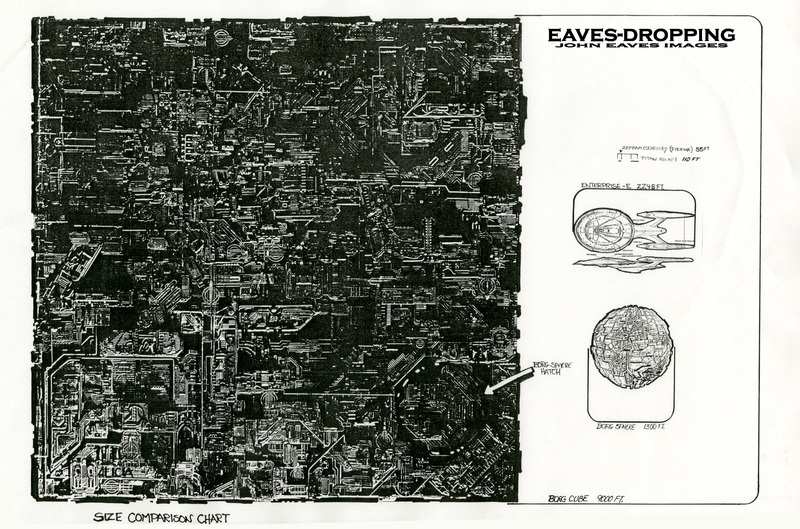 The Enterprise-E changed shape several times between the original sketches, the ILM model, and the Nemesis redesign. John Eaves has kept it at 2248′ throughout (only rounded up to 2250′ in his Nemesis comparison chart), probably because the main scale driver in this case was the length of the ship next to the other Enterprises, which is how the 2248′ was determined and approved, so it made sense to keep this number always the same. So this is what I get from the chart (just confirming what Boris already posted). The Akira is somewhat bigger than I assumed (500m vs. 440m) when I scaled the lifeboats to those of the Sovereign. So what should I do? Increase the Akira to 500m nonetheless? I have no problem with scaling the other three Starfleet ships according to the chart, although the Steamrunner, like the Akira, would have to be somewhat smaller based on the lifeboats (400m vs. 366m). The Borg sphere depiction is somewhat distorted. If I take the average, I get 450m diameter, just what I always assumed. This is a compromise that would keep the two vessels with the same lifeboat types as they are (at EAS), and would scale the other two according to the chart. may I ask where and when the Pantone color list for the E will be posted? I am also very interested in the same list for Defiant (NX-74205) because it is difficult to get good color references due to different lighting conditions. the color suggestions for the model kit are less than ‘stellar’ -sorry just couldn’t resist a pun !